Yesterday I started moving from macro scale to micro scale, outlining a set of possibly-related campaigns. Now I’m digging for some more detail in Donnerkonig Heirs. I’ll start by working on the graph for the campaign. I know I’ve got Keys of Heraka-at and four adventures to acquire the treasures needed later. I’ll be looking for at least four more adventures to associate with these. I’d like to have about ten adventures available to me, but I’m going to start with a graph of fifteen to give me the option of culling, removing adventures rather than looking for an exact fit. 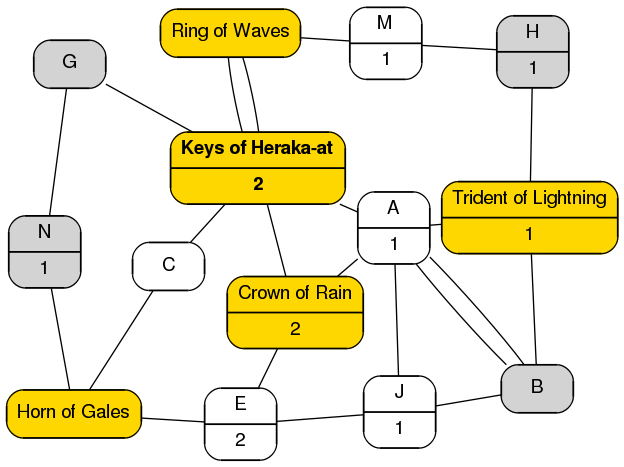 This graph clearly has a central adventure (K) that I will take to be Keys of Heraka-at, and five branches out. The PCs should be able to find something to do. 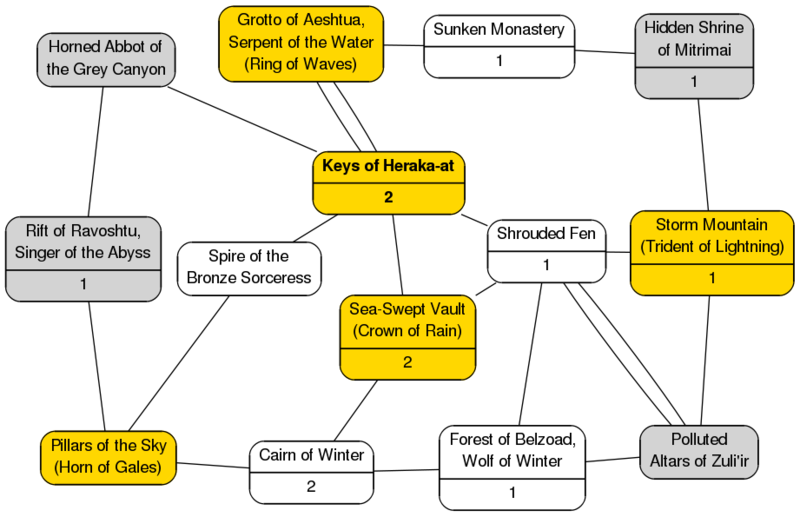 The Keys of Heraka-at may actually reveal the locations of the treasures and the PCs can go get them, or may provide some direction toward the treasures and the first step there. I’d like to see an average of two adventures possible related to getting each treasure, but allow shorter routes in some cases. Some of my early attempts were pretty linear, really consisting of just the choice of which item to go after first. I think I will vary this a bit. First, I note that ‘K’ has two sub-elements. I’ll have to think of something to put there. Also, there are two edges between ‘K’ and ‘L’, twice the opportunity for the PCs to choose to go that way. I think I’ll make that… if not an easier adventure, at least one that is more straightforward. ‘A’ is another significantly-connected node, with five directions to go, but they are much shorter. I expect the players will be passing through here a few times, and seeing the double link from ‘A’ to ‘B’ suggests this might make a good place to put a link to another campaign — in or out. ‘B’ is likely to be an overlap adventure, ‘A’ is nexus. 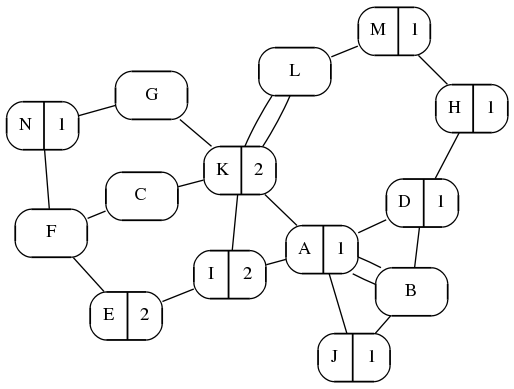 ‘I’ connects to both ‘K’ and ‘A’, so it should be ‘easy to find’ a path there, so ‘I’ will take the PCs in a direction toward treasure. 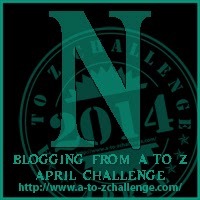 I will only place treasures at nodes that have three edges, making it reasonably certain they can be reached. Initially that means ‘K’, ‘F’, ‘I’, ‘A’, ‘D’, ‘B’, and technically ‘L’ are eligible, but I might add more edges if I don’t like how that looks. This gives me one that should be easy to find (the Ring of Waves at ‘L’), one that can be close but has two nearby routes from ‘K’ (the Crown of Rain, at ‘I’), one that is fairly near an overlap adventure (the Trident of Lightning at ‘D’ is close to the overlap adventure at ‘B’), and one that may be a bit more work to get to (the Horn of Gales at ‘F’). There are no purely linear approaches that are two or more steps long — the closest to linear is the double path from ‘K’ to ‘L’, and even that has a ‘long way around’ option to get there. I’ve still got nine adventures I know nothing about, and the four ‘treasure adventures’ could stand to have better names but they’ll do for now. I’d like to have some idea what’s there, so time to break out my old school adventure namer and look over the results. I tried to select a range of what are likely to be dungeon and overland adventures. Some can lead right out of the campaign, but it is possible to achieve all the treasures without touching any of these, though there may be benefits to doing so. I know nothing about the other campaigns, but until it looks like the PCs are getting closer I probably don’t need to. Okay, that’s enough for tonight. I’ve got enough now that I can start working out The Keys of Heraka-at and lay good (I hope) clues and leads to the treasures that will lead to identification of the Donnerkonig Heirs and the Return of the Donnerkonig. I expect I may change the relationships shown here, and possibly add or remove nodes, but this is a start on an improved level of detail for the gateway adventure. Did you roll up a bunch of names and then assign them to nodes, or roll each node in order? I see you added a double edge on E–J to highlight the “winter” connection. You’ve also dropped the A–J edge somewhere along the line. I was actually aiming for a single edge on E-J, I may have accidentally doubled it, I seem to recall thinking that A-J was linked accidentally. By the time I noticed I’d already uploaded and it was late. By that point I just wanted to cut and ship. Yeah, that’s a goof. Fixed. I just noticed that I hadn’t answered the first question. I generated a slew of graphs and chose one that appealed to me. I then assigned adventures as I felt they might best fit. The critical ones are (minimally) one or two steps away from The Keys of Heraka-at, then I found others to fill the other nodes. All except Storm Mountain were randomly generated, or inspired by randomly-generated names. Storm Mountain was a blog post from July 2007. I always wanted to come back and flesh it out, and this looked like a good opportunity. I did some analysis on graphs which you find “pleasing”. Ignoring double edges, they seem to consistently have ~125% as many edges as nodes. The proportion of edges which are doubles ranges pretty far: the world map in your M post has 6% double edges, whereas today’s one has 17%. I think that’s an outlier though, 5%–10% seems more typical. I’ve got a python script that can generate random planar graphs: I’m going to adjust it to make a proportion of the edges doubles and try applying the above observations. 1.25? Sounds plausible. A minimally-connected graph will have an average of a little less than 1.0 (linear graph of n nodes needs n-1 edges). I want to see some redundancy so the critical nodes have multiple paths coming in (and nodes have multiple paths going out, so there are choices). I actually like to have a little more hair on the diagrams, some leaf nodes. I can park special, optional stuff there. It just so happens that the diagrams that have the connectedness I want internally have not had that. I expect you’ll see some in the next post… but it might still have ~1.2 edges:nodes. Not just linear graphs, actually: every minimal spanning tree has exactly n-1 edges (today’s fun fact). You’re also probably going to have an upper bound of 200% since the graphs are usually subgraphs of a planar triangulation of some sort (which have 2n-3 edges). I can see a way to add a fine-tuning parameter to the algorithm to give a bias towards leaf nodes, I’ll try it out. Yeah, you’re right, of course that would be so. I blame having just woken up, the linear case was the simplest to imagine. I’ll be interested in seeing the updated algorithm. “Moderately hairy well-connected planar graphs” sounds like what I’m looking for, though I don’t need to maximize connectivity internally. Still, it’s easy to cull links, so why not? Pingback: A Quick Overview of The Keys of Heraka-at | Keith Davies — In My Campaign - Keith's thoughts on RPG design and play.